Prior to the proliferation of affordable cars and flights after World War II, the most common mode of cross-country travel in the US was the train. Trains had their own culture and a mystique that survives even into the modern era due to their profound impact on American culture and lifestyle. More than mere conveyances, they were places to be. 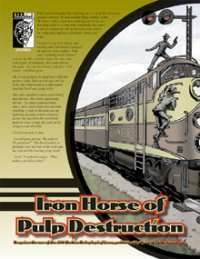 Whether playing cards in the club car with a sultry dame and shifty eyed stranger or hiding out from the railroad bulls in the back of a boxcar or the dramatic chase across the roof of a moving train, they are classic elements of pulp fiction and as such are inevitable components of any pulp campaign. This 9 page PDF is an easy-to-integrate PC class and just the sort of thing needed for GMs to add depth to any great d20 Modern Neo-Pulp setting and campaign world including Haven: City of Bronze.